I thought that the next talk given by MIT's Pranav Mistry at TED India earlier this month was worth posting over here. True, most of the use cases shown in this video were already presented on February. And true, Graz's Daniel wagner was absolutely right calling Sixth Sense conceptual. 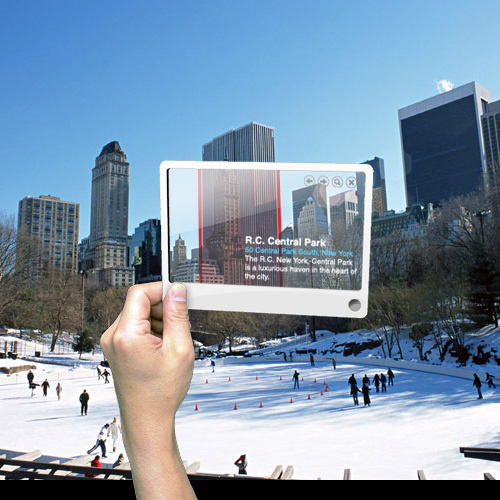 Juniper research is predicting that mobile augmented reality will by a $750 million industry by 2014, which is a lot more than the previous $350 million estimate by ABI research. Just a quick reminder - Twitter is valued at one billion dollars. Tish Shute preaching for Wave powered augmented reality infrastructure at Mobile Monday Amsterdam. Thomas Carpenter reveals Qualcomm's plans to use face recognition to create augmented social networks. Target uses AR markers to spin a virtual wheel, but I wouldn't call it augmented reality otherwise. InStyle magazine has an augmented version of its December cover (using Total Immersion's tech). And more of Total Immersion - augmented albums for some Brit and French bands. Do you think that easier access to information will help or hinder meaningful social interactions? Will it create a bigger gap between people who can leverage virtual communications to widen their social network and those who are more reclusive? Do you think AR is more likely to expand or shrink the majority of people's social networks? Like many other technologies, scifi grade augmented reality can have both a positive and negative effect on one's social life. Reclusive people will find the loss of anonymity a real threat, making them even more reclusive. On the other hand, friendly people will find more people to befriended with, and common interests with strangers. A group of students from the National University of Singapore have created a Simcity like (or rather Farmville like) augmented reality game. I'll stick with the non-augmented version for now. An interview with Zugara's CEO Matt Symczyk on the launch of their Fashionista application. I'm not sure why, but I really like this simple terrain generator, it's use of AR just seems natural. And this week's video comes to us from MindSpace Solutions a spinout company from Hit Lab NZ, which created a device called the Digital Binocular Station. Using extra sensitive sensors in the base station, this pair of binoculars can augmented a museum display (or any other room) in a way unmatched by any of their competitors, or at least that's what the video suggests. I'll have to visit New Zealand to try it out (here's my vote for holding ISMAR 2011 in New Zealand). As for the control mechanism, we actually have some devices that are able to read brianwaves and infere what the user is thinking about, so the choice was easy. The newest and most promising headset for thought control is the epoc, not yet on the market, but with a free SDK I can play with. With this technologies I was actually able to develop something that works and doesn't need any special stuffs you can't buy off the shelf. In the story, the players controls 3 airplane each, but in practice it was too hard to simultaneusly control 3 airplanes, so I reduced the number to a single airplane for each player. Furthermore, since the airplanes are not projected into the real world, it's suggested you wear a HMD. You can download the binaries and source code and learn more about this interesting project here. MIT's Sixth Sense to be open-sourced. Well, I know most don't see any future in projector enabled augmented reality, yet there's more to Sixth Sense than a projector (gesture recognition, image recognition), and it's a lot more feasible than see-through HMD AR at this stage, so quite exciting news. Augmented Planet has started doing a head to head comparison of the different AR browsers out there. Rumor has it that round two features very surprising results. More from Augmented Planet - vote for your favorite AR application this year and you may win a Chumby. A demo of Esquire's augmented reality issue. The comments are even more interesting than the video itself - "Holy balls you guys are﻿ innovative! Props!". Wear a virtual hockey mask by Xcel Energy, or in other words, augmented reality is for kids. Seat using augmented reality to sell cars? That's nothing like I've seen before. Over all the reviews are very positive, and since it's free you can't lose. iTunes link here. You knew it were coming, Tish Shute has a very extensive review of ISMAR on UgoTrade that has plenty of pictures of the cool demos and attendees. Layar's CTO Dirk Groten shares his reflections on ISMAR, focusing on the presentations given by the various augmented reality browsers makers, each focusing on a specific niche, and exploring where browsers can go next. Programmer Joe has an excellent summary of his adventures at ISMAR. Here's a point worth keeping in mind "I think that ... Layar pushes location based services forward in a huge way by providing access to multiple content providers from a single app. One day no one will remember that they started out as primarily an AR app." Thomas Carpenter has his own summary with some great points, for example, "Don’t wait. Use the technology at hand to make the killer AR app." And here's a video summary of Columbia university research into augmented reality menu systems, which produced the interesting result that users have better response times when menus are aligned with the camera coordinates than with the coordinates of the item they are augmenting. Gail Carmichael explains it in detail over here.